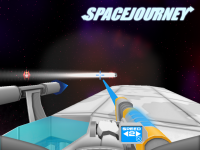 In SpaceJourney, you assume the role of a lone space pilot in a small cruiser. You fly through space, exploring the unknown. Being that you're the sole commander of your ship, you command it manually from the inside. And not only can you walk inside your small ship, but you can also walk outside of it, with anti-gravity. 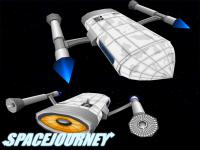 I'm proud to announce the latest update to SpaceJourney in Version 1.2.1! 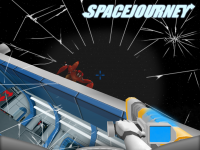 For those of you who haven't heard of SpaceJourney, it is a sandbox game that combines first person shooting, space simulation and adventure elements. You're basically a space captain in a ship piloted by only yourself. And there are plenty of dangers out there in that big unknown wanting to either eat or destroy you. You can walk inside your ship, walk outside of it (using anti-gravity) and walk around locations you've docked at (so far I only have a measly little space station you can tromp around in, but its better than nothin' right?). There are enemies that you'll fight with your gun (i.e. 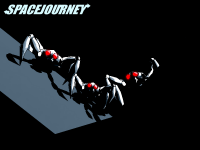 spiders, blasting meteors, etc) in the style of a first person shooter and enemies you'll fight ship to ship with your vessel's defense and weapon systems, in the style of tactical combat games. Aside from fixing annoy glitches here and there, the biggest update are three new functions to the gun: RUDDER, STATS and JUMP mode. All three of those functions were designed to make things simpler and more efficient for the player. STATS MODE: Pressing the shield icon on the left gives the player the status of the ship. Ship stats will tell the player what the strength is of the ship's hull and shield. Written as so: SHD = shield strength, BDY = hull \ ship body strength. JUMP MODE: The Arrow icon on top is the "jump" function. In version 1.2, there was a progress bar added when you starjumped-- telling you how much longer the jump sequence would last. So now that feature can be displayed on the gun. Also, this function will show the player their score-- points they get when blasting rocks away, fighting spiders or even disarming warships. RUDDER MODE: The steering wheel icon to the right is the new "rudder mode". Rudder mode allows the player to steer the ship from the roof of the ship and regulate the speed from the gun. Basically, you press the trigger button and the ship will steer in the direction of the blue laser. If any of these are confusing, please check out the trailer above! It shows off all of these new gun functions in action! In the very next update there will be smoother aiming with the gun and a save feature. On paper that doesn't sound like much, but I've been wanting to release more updates in smaller time frames. And saving is a standard feature most people expect. 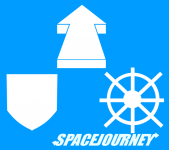 Down the road, there will be a 5th sector (and possibly 6th) and more explorable ships. Like you know that Zeetog warship you destroy in Sector 3? I'd like you to be able to board that vessel. Also, a freighter will play a bigger role in the game. I also want to add a currency-- what I have in mind for that will be discussed more when I get closer to adding it. You can also expect there to be more functions added to the gun. Just as a few ideas to throw out there-- you could easily see a mini-inventory, object grabber, object scanner, a function for managing currency and a mini-map. How all of these functions will end up on the gun is probably by using the back console and loading the gun with more functions, while only allowing the player to use three at a time. That's the gist of it! I hope everyone enjoys the new update! 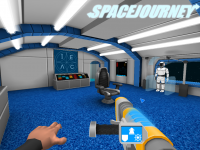 A first look into what's to come for the next update of SpaceJourney. Details about the new update to the first person shooter \ space simulation hybrid. Where you manually operate a ship from the inside. A formal introduction to the main antagonists of the game. 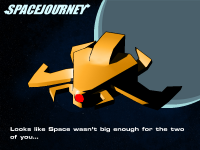 SpaceJourney, a sign of things to come! 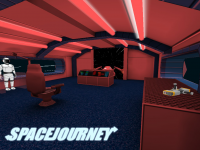 This is a sneak peak of the progress that I have made for the next SpaceJourney release. In this small demo, the objective is to go to four different sectors and find pieces to an artifact (one in each sector), using your tractor beam. 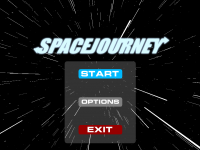 The New Menu for SpaceJourney game,the game and the texture are in the beta version! Wait for Updates! Hey, thanks for playing! I'm glad you enjoyed it! There will be more updates to come! I love how you are coming along with this game, I played it but died after getting 2 pieces. I think you should continue with this idea of yours, and are you thinking about taking this to multiplayer? maybe? Many thanks for your feedback and comments. I appreciate the support. That's great that you got 2 pieces! If you die the game will return you to sector 1, but you still keep your inventory. In the next update or so there should be save games so you can come back to your inventory if you quit the game. I would love to do multiplayer (co-op would work especially well). But it might be a while before I dive into actually putting it in, since, it would be a can of worms trying to program that and I'm currently the only programmer. Hello i played your game and i think it's wonderful! however, after retrieving all 4 artefact i didn't know what to do, i tried to hyperjump to an already visited sector (the one with station), but with shields on at 100% and hull at 100% i get the ship destroyed in the time i try to reach the external body to destroy asteroids!!! First of all, thanks for playing! I think you're one of the few that's beaten the game, to my knowledge. If you get all 4 pieces there should be a "complete" artifact added to your inventory and if you check your score you should have a nice bonus! After beating the game, the only other thing to do (besides just roam around), if you haven't already, is to get the other items from the other sectors-- like for instance there's a gas can item you can retrieve in sector 1 and a pogo stick in sector 2. Each sector has one item besides the artifact pieces. In the next update or so, there will be achievements, so the game will at least recognize that you did that kind of stuff after beating the game. I want to apologize for your ship getting decimated so fast when you were at full power! Which sounds like some kind of error in the game. Now after dying, the game should just return you to sector 1, with your inventory intact. But I still think being able to save your game in the future will help things. That way, you can still come back to the game after beating it. Again thanks for playing and thanks for posting your comment! Its appreciated. I was just playing v 1.2.. it's awesome! I died. Haha. Nice, haha! Thanks for playing! How was it, performance wise? Some people have been reporting sluggish-ness. Hey! I'm going to make a video for YouTube on this game! It looks really really good, looking forward to playing it and uploading it. I believe I am the first person to upload a video on the game. Could you please give me your email just in case I have some questions? Thanks! Wow! Thank you for much! That'd be great! I'll send you my email in a private message!